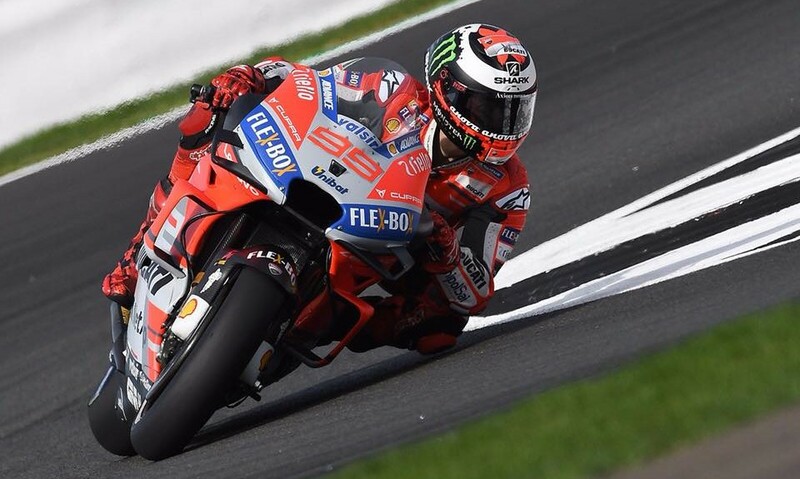 Jorge Lorenzo (Ducati Team) secured a sensational second pole position of the season at the GoPro British Grand Prix in a breathtaking Q2 session at Silverstone. His teammate Andrea Dovizioso takes his third consecutive front row start in second. Johann Zarco (Monster Yamaha Tech 3) rounds out the front row at the British GP. 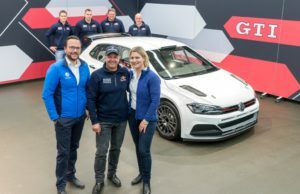 The start of the second qualifying session was delayed. It’s because of the medical helicopter waited to return after taking Tito Rabat (Reale Avintia) to hospital. FP4 accident left the Spaniard with suspected right leg fractures. However, with the threat of rain looming over an already mixed-condition Northamptonshire layout, the 12 riders went out on wet Michelin tyres. After graduating from Q1, Bradley Smith (Red Bull KTM Factory Racing) was the early pace-setter. 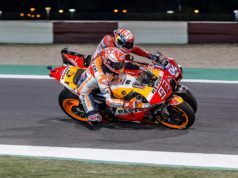 Before Jack Miller (Alma Pramac Racing) led Dovizioso and teammate Danilo Petrucci over the line to give the Desmosedicis a provisional front row lock out. But this was just the start of the constant chopping and changing for pole, with home hero Cal Crutchlow (LCR Honda Castrol), Zarco and Dovizioso setting the fastest times of the session in tandem. It was a case of de ja vu for Miller. He took the gamble to head out on slicks, just like he did for pole in Argentina. It was a gamble that looked to be paying off in the first sector. But when the Australian reached the treacherous Turn 7, he ran on and lost the lap time. Meanwhile at the front, with the clock ticking, Lorenzo made his move to go provisional pole by 0.159 after Dovizioso had gone 0.905 ahead of the field. The two Ducatis would stay P1 and P2 as the checkered flag came out. However Zarco knocking Crutchlow off the front row on his final lap. The Brit starts P4 at his home GP, with Marc Marquez (Repsol Honda Team) managing to salvage P5 on his final lap. 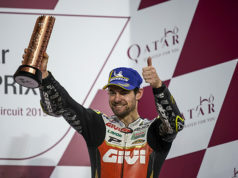 He was 0.928 behind the Ducati duo. Petrucci claimed sixth to join the Hondas on the second row. Andrea Iannone (Team Suzuki Ecstar) is spearheading the third row for Sunday’s showdown. This was Smith’s final home GP qualifying session for the foreseeable future. And what a session it was. The KTM rider earning the Austrian factory their best qualifying result of the season. The Brit looking very strong in mixed conditions. Miller’s gamble didn’t pay off in the end, he’ll start P9, with Q1 graduate Alex Rins (Team Suzuki Ecstar) rounding out the top ten. After a strong start to the weekend, Q2 didn’t go the way Vinales and teammate Rossi wanted. The Spaniard will start P11, And Rossi seemingly mistiming his tactics when coming in to change his tyres. He missed out on a final flying lap by a fraction of a second – 12th for the ‘Doctor’.